Babblings of a Mommy: Style Inspiration: 3 Rules For Mixing Prints. Style Inspiration: 3 Rules For Mixing Prints. Mixing prints takes ballsy style instincts. You either look chic and fashionable, or like you got dressed in the dark. Unfortunately, I feel like I would fall in the latter category so I did a little research and found a few helpful tips that I think help accomplish the fine balancing act of pattern mixing. 1. Use different scales. In other words, if you have a smaller print top use a bigger graphic pattern on the bottom, and vice versa. 2. Stay in the same color scheme. Prints look more cohesive and stylish when paired in a monochromatic outfit. 3. Use animal prints as a neutral. You can pair animal print with just about everything and it will look stylish. Remember the art of mixing prints isn't for the timid, but if done right everyone will admire your fearless fashion sense! Are you a fan of mixing prints trend? I love mixing prints. One of my favorite trends right now that I am totally embracing! I love it! It makes outfits so much more interesting! great tips! 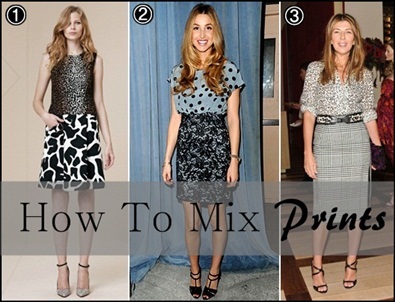 when i mix prints i like for the prints to at least have 1 color the same or in same family! Thanks for these simple tips. I'm still a little scared of this trend but I must try it!! Excellent tips! I love using animal prints as a neutral! Great tips and examples. I love mixing prints and the last two season have gotten much better and bolder with it. Love the idea of animal as the new neutral! Have a fashionable weekend! Love all 3 outfits!! Amazing what mixing prints can do.